Eleven-year-old Parvana (voiced by Saara Chaudry) lives with her family in a one room apartment in Kabul, Afghanistan, which is under Taliban rule. When her father is arrested without warning for being an intellectual, Parvana's mother is left alone to care for their three children. Banned from going out in public without a man, the family becomes desperate for food. Parvana must cut off her hair and disguise herself as a boy so that she can venture out in public and become the breadwinner for her family. The first thing that struck me as I watched The Breadwinner is the film’s exquisitely beautiful animation. As we have come to expect from animation studio, Cartoon Saloon (responsible for Song Of The Sea), every frame is stunning. You almost want to freeze the movie in order to savour each tactile and gorgeous image. As well as being pleasing on the eye, the animation in The Breadwinner is central to its exploration of the power of stories and the art of storytelling. Stories remind us of our past and of how things change. Stories can give us strength in the darkest of times. For these are dark times indeed for Parvana and her family and director, Nora Twomey, does not shy away from the hate and violence that blight their lives. The Breadwinner is rated 12 for good reason - there is a real sense of danger and many scenes are upsetting to watch. However, Parvana’s is a story that needs to be told. We need to understand how women are treated in the world. As Nobel Peace Prize winner, Malala Yousafzai, commented: “the book [by Deborah Ellis, from which the film is adapted] tells the story of a young girl who takes on the challenge of saving her family. I think it’s important for girls everywhere to learn how women are treated in some societies. “But even though Parvana is treated as lesser than boys and men, she never feels that way. She believes in herself and is stronger to fight against hunger, fear and war. Girls like her are an inspiration. The Breadwinner reminds us how courageous and strong women are around the world." Twomey’s film, which was nominated for an Academy Award, is similarly inspiring. Feisty from the start, Parvana is a strong and determined young girl. She understands the gravity of her family’s predicament and is willing to risk her life in order to save them. By cutting her hair and dressing as a boy, Parvana becomes Atash. As a boy she can move freely outside, buy food and collect water without fear. She relishes the freedom and power of her new identity - further highlighting the outrageous way women are treated in her community. In these scenes, The Breadwinner encourages us to enjoy Parvana’s youthful exuberance. The film also reminds us that, even on the darkest day, we can still find kindness and friendship. Amid the tension and despair, Twomey’s magical and beautiful film also gives us many opportunities to smile. The Breadwinner’s score, by Jeff Danna and Mychael Danna is also wonderful and atmospheric. If you enjoyed the animation of The Breadwinner, I would recommend Cartoon Saloon's Song Of The Sea and The Secret Of The Kells. 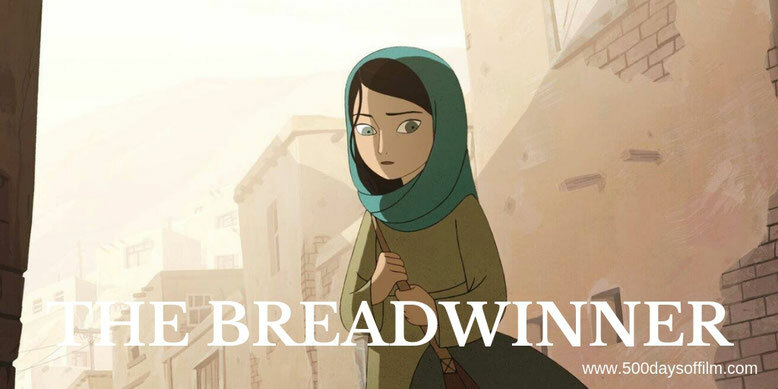 Have you watched The Breadwinner? If you have, what did you think of this film? Let me know by leaving me a comment in the box below or let’s talk animation over on Twitter. You can find me @500DaysOfFilm.